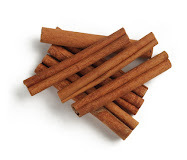 CIMETOVA KNJIGA-CINNAMON BOOK: SKYR IS IN FINLAND! I was actually thinking to write some other post today, but then I went to one of the local stores to buy some fruit. When I passed the fridge with milk products, something caught my eye. I stared. I could not believe. What I had stared at was so very familiar to me, yet it belonged to my images and memories from some other Nordic country. There, on the top shelf, there was a pile of pots with the very real and the very Icelandic SKYR!!! Woow!!! This surely is the news of the day as I am so very happy that Finland has started to import skyr from Iceland. Now what is skyr and how have I fallen in love with it? According to Wikipedia, skyr is an Icelandic cultured dairy product, similar to strained yoghurt. Technically it is a very soft cheese. It is very popular in Icelandic cuisine. It seems to have originated in Norway and been brought to Iceland by the Vikings. Skyr has a slightly sour dairy flavor, with a hint of residual sweetness. 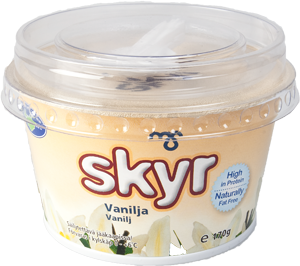 Commercial Icelandic manufacturers of skyr have added flavors such as vanilla, berries, etc. common to yogurt to the final product, to increase its appeal. Skyr is exactly what I was longing to taste even before my first trip to Iceland in 2003; you must know that I have always been a big fan of Iceland, anyway. 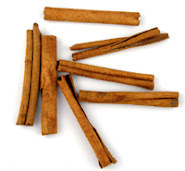 During my first trip I ate really a lot of skyir; I guess I don't need to repeat how much I liked it. This summer I went to Icleand again - and the first thing I did when I came to Keflavik airport was that I had bought a skyr in the shop on the airport and ate it outside while waiting for the bus to Reykjavik. Strawbery skyr. Then, I dragged my two friends all over the city to the biggest shopping center in Reykjavik, Kringlan, just because I had read that somewhere near that shopping center should be an ice-cream shop, which sells skyr ice-cream. I took a map and walked and finally found ÍSland, the place with great home-made skyr ice-cream. And of course the last thing I ate in the morning before leaving Iceland in August 2010 was again a big pot of skyr. I have missed skyr. Until now. I really like such cottage cheese/yogurt-like products; however, skyr is, at least for me, something special. It should be also very healthy, low on calories and with lots of proteins. My favorite flavors are vanilla and strawberry, but I also like others. However, it seems that the economic crisis has affected Iceland also in the way that they have started to export skyr to Nordic countries - first, I think, it was to Norway in 2009. Well, I just hope Finland will like skyr, and that the product will remain here in our shops. For the benefit of the Icelandic exporters - and just because skyr rules. Mmm, you make it sound SO good! :D I like this kind of dairy product myself, I'm a big fan of youghurt and cheese and cottage cheese - basically anything from milk, as long as it's not raw milk, since that I find quite disgusting.